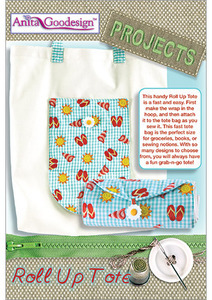 Roll Up Tote/Projects Collection/ 15 Designs total - All Designs are 8"x 11"
This handy Roll Up Tote is a fast and easy. First make the wrap in the hoop, and then attach it to the tote bag as you sew it. This fast tote bag is the perfect size for groceries, books, or sewing notions. With so many designs to choose from, you will always have a fun grab-n-go tote!